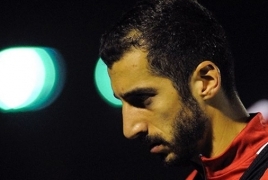 PanARMENIAN.Net - Armenian midfielder Henrikh Mkhitaryanis being assessed before Arsenal's trip to Manchester City in the Premier League on Sunday, February 3, SkySports reports. Mkhitaryan has been out of action since December 19 after he fractured a metatarsal in his right foot during the Carabao Cup defeat to Spurs. But the 30-year-old has appeared to be training on his own at London Colney since late January. Arsenal manager Unai Emery revealed earlier that Mkhitaryan is being “integrated back into full training."